We all know the kinds of software we like using, whether it is something for personal use or business. There are a lot of elements that are involved with making software and if you get just one wrong, it can make a big difference to the end user. So what are those elements? And how can that affect the general user’s experience? Our MD is tackling that very question (as it relates to the software a business requires, in his latest article for Business Direction. This article also appears in the latest issues of Business Intelligence, Business Edge, and Business Comment. What Makes a Great Business Software? For as long as I can remember I’ve been fascinated by what makes a good piece of software. As the first iterations of Windows and Apple OS were released, the world was awash with questions, ideas and brainwaves as to the utopian future computer software would bring. Fast forward to 2018 and software is a major part of our lives, both personally and professionally and for many of us, something we now believe we couldn’t live without. But with many business software packages, including ours by the way, bringing a myriad of time and cost saving benefits, I wanted to share the 4 key components you need to consider to ensure any software is truly worth it’s investment. It may sound simple, but your software has to actually do what you need it to. A fully featured solution is a must, ensuring it can meet the needs of your business even when those needs may be subject to change as you grow and evolve. I’ve seen many people get blown away by fancy marketing campaigns and sales teams who promise the earth, only to find out what they need simply isn’t available – often after they’ve parted with their cash. I’d always recommend taking the time to work out the objectives you need to achieve, mapping against your business processes where possible. As you engage in the buying process, ensure the functionality is all there, either asking for a demonstration or taking a test drive of the system yourself. In the end, to bring the benefits your investment deserves, the software needs to deliver. In the same way you would only hire a new team member who shows they can bring the desired output, make sure you put the software (and the provider) to the test first to ensure you have all the functionality you need! With the functionality assured, you need to actually enjoy operating your new software and that often has a lot to do with the interface. Take some of the most popular email clients around such as Outlook or Google – the core functionality of what they do hasn’t changed in a while, but they’re constantly updating their interface to make the experience slicker. 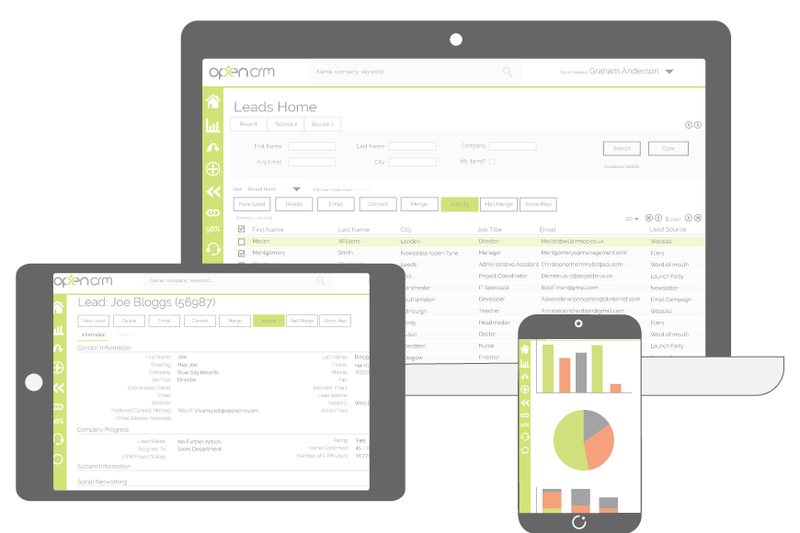 We recently released a new version of OpenCRM, incorporating a brand new interface design to provide a modern and refreshing experience to our customer base. It’s amazing what slight tweaks in colours, fonts and layout can do to make a big different to the overall enjoyment of a system. So, when you’re looking at a new software package, remember to ask yourself if the experience is a good one. The goal is to make your business life easier and more enjoyable. After all, if it’s software that’s central to your working day, you’re going to be staring at it for many hours a week. Failure to pick something you truly enjoy will leave you feeling a little miserable in the workplace and will most likely mean your back on the market for a change in no time at all. In a modern business climate, organisations need to be dynamic and adaptable to stay relevant in their marketplace, so why should their software be any different? The software you land on needs to have an inherent level of customisation to ensure it really does fit your business, both now and in the future. Let’s take an example – imagine if in your business, you referred to your end users as ‘clients’ but your software system called them ‘customers.’ Seems like a small difference, but you can probably deal with it, right? Wrong! Your systems need to fit your business, they need to reflect what you do, say and feel to give you and your team the most value. Even something as small as having the right terminology makes the user experience 1000x better and helps to slot straight into your business as though it was just another member of the team. There are many ‘off-the-shelf’ systems out there that are highly malleable to give you and your business exactly what you need. If your needs are really unique, don’t be afraid to ask about Custom Development options or even consider a bespoke software solution to give you the maximum benefit! With us all operating in such a technology driven landscape and so many different software packages on the market, one single system is never going to do it all. You need your different software packages to speak with one and another to provide a harmonious experience between different processes. Whether it be as simple as capturing communications or more complex operations like syncing large data quantities, the modern software should always have the ability to work with others. If your data is held ransom in a single system, it’s going to mean a lot of duplication of effort, with the initial benefits of taking the system on becoming completely redundant. We live and operate in an interconnected world, so ensure whichever new piece of software you adopt has the power and functionality to collaborate with systems you’re currently utilising. Combined with the previous points, a system that has the ability to be part of an overall integrated solution is really the key difference between being just a good piece of software, and being a great one!